Discover the best of Thai cooking in this first title in a series of cookbooks showcasing the best of the cuisines in Asia. Now you can replicate with ease, the distinctive flavours of timeless Thai favourites including the aromatic and savoury Hot Basil and Minced Meat Rice, piquant Dry Curry Beef with Lychee and crispy, fragrant roasted Lemongrass Chicken. Each recipe is written in easy-to-follow, step-by-step format, with clearly taken photographs to illustrate each step, and the final dish. 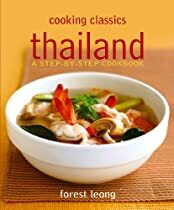 Included is also a section on Thai food culture and Thai cooking techniques to provide readers with a greater insight into the cuisine.